What are the best 4 inch speakers? If you're tired of the quality or volume your current speakers produce and you think it's time to get you some new speakers, I've got you covered. 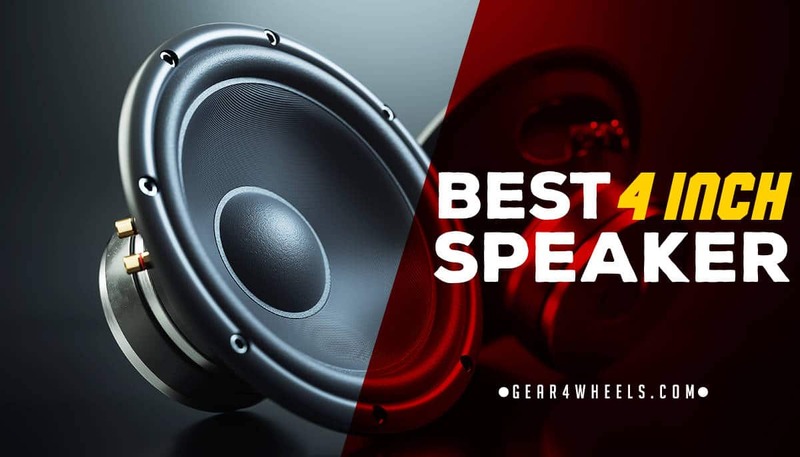 I've tested over 300 different models from brands like Hertz, Rockford Fosgate, Kicker, JL, Pioneer... and I've found what I believe are the top 5 speakers to buy in 2017. Works well as part of a component audio system. Compatible with a wide variety of factory car stereos. If your existing speakers are part of a multi-component speaker system, or you are building a custom multi-speaker audio system, these speakers are going to be your best bet to replace 4-inch midrange speakers. JL Audio make some of the best premium aftermarket component speakers available, and these 4” speakers definitely deliver the goods when it comes to midrange frequency response. For 4” speakers with a fixed frequency range, these speakers are quite loud at 75 watts RMS each, adding a significant boost to vocals and midrange instrumentation. If your current speakers configuration tends to drown out midrange sound in the bass and treble ranges, these speakers present an elegant solution. These are purpose specific speakers for use in combination with a woofer and tweeter. They aren’t going to perform to expectations if you are replacing a pair of full range door speakers. You will also need a 3-way crossover (not included) to properly split the frequency between bass, mid, and treble frequencies. You will also more than likely need a stereo headunit that has an output of 25-150 watts RMS per channel to drive these speakers, which is typically much more than the average factory car stereo. Speakers need a 3-way crossover to work properly. Looking for the best sound quality you can get from a 4” car speaker? Hertz Audio has the solution. The HERTZ DCX 100.3 model is the speaker you want. With their excellent sensitivity, powerful wattage, and exceptional frequency response range, these speakers are going to give you the best possible sound for your money. One of the best things about this speaker is how well it handles midrange performance. Many 2-way component speakers do not provide adequate quality for midrange frequency performance, muddying vocals and midrange instrumentation. These speakers provide exceptional performance with lows, mids, and highs, and they have their own built-in crossovers to handle the appropriate frequency splitting. At 30-watts RMS, these speakers are also quite loud even when used with factory car stereos, and with a peak of 60-watts they can handle most aftermarket stereos with eas. If you are looking for a set of speakers to use with a powerful aftermarket or head unit or standalone amplifier, these would not be my first choice since they max out at 60-watts. Additionally, theses speakers do not have adaptable mounting brackets included in the box, so it is very important to verify that they fit your model vehicle before purchasing. Mounting brackets non-adaptable, so they may not fit certain existing vehicle 4” speaker enclosures. For aftermarket speakers that deliver performance and audio fidelity, Rockford Fosgate possesses an excellent reputation among car audio enthusiasts. The P Series from Rockford Fosgate is a regular in our lists and they did make it into the top 5 car speakers of 2017 overall. Well designed, easy to install, high quality build materials are the hallmarks of this manufacturer, and these 4-inch full range coaxial speakers are no exception. I did another review of this same series for the 5.25 inch model. These are some loud little speakers for 30-watts RMS, and they fit and install easily thanks to their modular bracket design. Their performance for clarity and fidelity are very good considering their size, and they are compatible with many factory car stereos thanks to their lower RMS power draw. Looking to build a powerful custom audio system? These speakers probably won’t be up to the challenge given their maximum 60 watt power handling. Additionally, the bass response on these speakers is not quite as good as it might be from comparable car speakers in the same class. Polk has a longstanding reputation for making the best quality home and automotive audio products that money can buy. This set of db401 4” speakers are marine certified, constructed of the absolute best possible materials, and well known for high audio fidelity performance. These speakers sound way bigger than their 4-inch cone size would imply. Their performance across the board with all genres of music is exceptional, and at 45-watts RMS/135-watts peak power handling they will work well with existing or upgraded aftermarket stereos. They are also extremely easy to install thanks to their unique mounting brackets and built-in frequency crossovers.. The included speaker grills are silver and not black? That’s honestly about the worst I can say about these speakers. They are a phenomenal value and provide a significant upgrade to your existing car audio system. Speaker grills are silver as opposed to black, which may make them a less than ideal choice for certain installations. Looking for better bass performance from your 4” car speakers? Kicker has got you covered with their DSC4 speake﻿﻿rs. Not only do these speakers look tough, but they can generate some serious low end despite their smaller size. These speakers may only crank out 30-watts RMS, but they have significant bass response compared to other speakers in their class. Add to that their crystal clear mid and treble ranges, and these speakers are an amazing value. If you are looking to install these as a part of a higher end speaker system, these may not be your best bet due to the lower power handling. When you want to give your car audio a significant upgrade without breaking the bank, swapping out your speakers is the best place to start. You want something compatible with your existing enclosures and that your factory car stereo can drive sufficiently in terms of wattage power handling. Finally, you also want to choose speakers that have the performance you are looking for across the audible frequency range for music. Muddy midrange sound, murky treble, and wimpy bass response may end up making you wish you had opted for something different in the long run.With all these considerations in mind, I’ve got what I believe is the best of the bunch in terms of overall value and performance: the HERTZ® DCX 100.3 4" Dieci Series. The sound quality of these speakers, their sensitivity, and their frequency response range all make them strong performers for aftermarket replacement speakers that will improve the sound quality of your current car audio without requiring an upgraded stereo or amplifier to get the best possible sound. Best of all, everything you need should be right in the box to change them out. No crossovers to wire or complicated installation hardware to fit. If you want better sound quality in your car audio today, get a pair of HERTZ® DCX 100.3 4" Dieci Series for your car, and make your daily commute the best part of your day.